I absolutely love this time of year. To me, Autumn means snuggling on the sofa under piles of blankets for guilt-free afternoon movies and hot chocolate when the weather is grim. And when it isn't, bundling everyone into their jumpers and coats and heading to one of the many amazing parks commons we are so lucky to have access to in this area. Autumn is watching my children explore in the changing landscape of windblown leaves carpeting the floors in all their bronzed-gold glory. It's the excitement of Halloween and bonfire night and the whisper of anticipation that Christmas really is just around the corner. And it is my favourite time of year to photograph families. There is so much fun to have outdoors and such beautiful backgrounds to be pictured in with all those glorious Autumn colours. 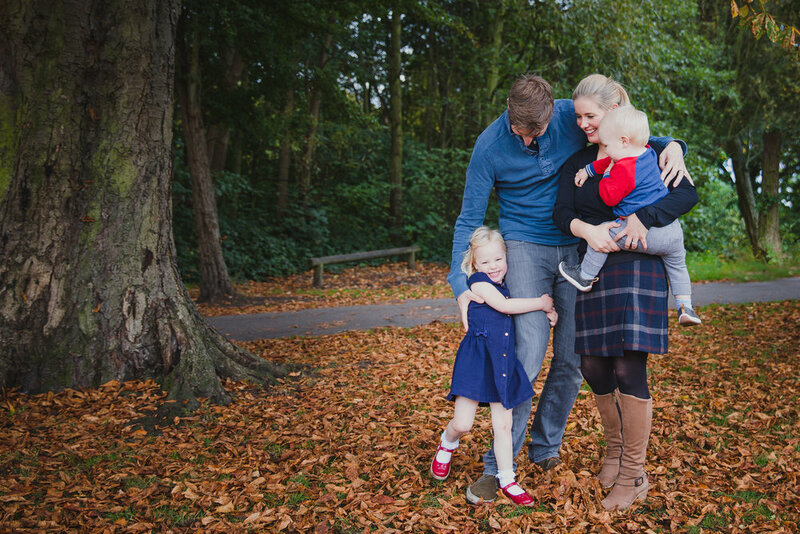 Over the weekend I got to photograph the very lovely Leavey family during an action-packed hour in Wandsworth Common. And, as an added bonus, they'd brought the grandparents along, so we got to include them in the fun as well. This common is one of my favourites for outdoor photo sessions and it is a wonderful place to have an Autumn photo shoot. There is a variety of scenery with the wide open fields, tree-lined paths and the secret trails that weave in and around the ponds. And I'm sure most of us have taken our children there to while away a morning or afternoon. For little ones there is fun in the familiar which helps them relax into the session. Not that Felix or Cleo needed much prompting to have fun. I have photographed this family before and one of the things I love best about these gorgeous children is their innate ability to completely embrace the joy of the moment. It doesn't take much, a tickle-fest, a chasing game, being thrown in the air by your awesome dad or a no-holds-barred, fierce cuddle with your lovely mum. The thing I love most about photographing families is seeing parents lose themselves in the moment, right alongside their children. The Leaveys were no exception, little Felix was on top form with plenty of giggles for his dad and mum (he gave us a beautiful performance, dancing on the bridge by the ponds) and his big sister Cleo was a bundle of energy, running, twirling, spinning with her grandad, playing with the fallen leaves around and throwing herself into her mum's arms for lots of lovely cuddles. Everything about this family was picture perfect and I couldn't have asked for a better way to start my season of Autumn sessions. 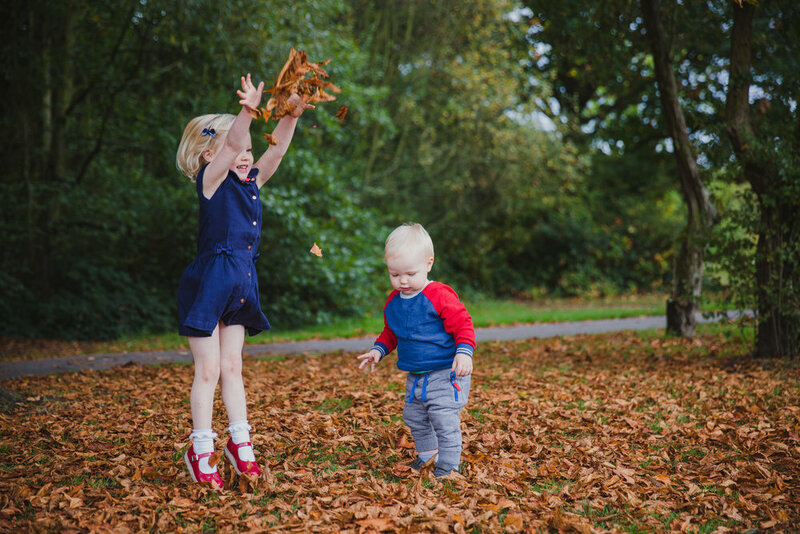 With gorgeous golden tones and lovely soft, buttery light, this really is the best time of year to take outdoor family photographs which - as an added bonus - make excellent Christmas presents. I'm currently booking Autumn sessions. 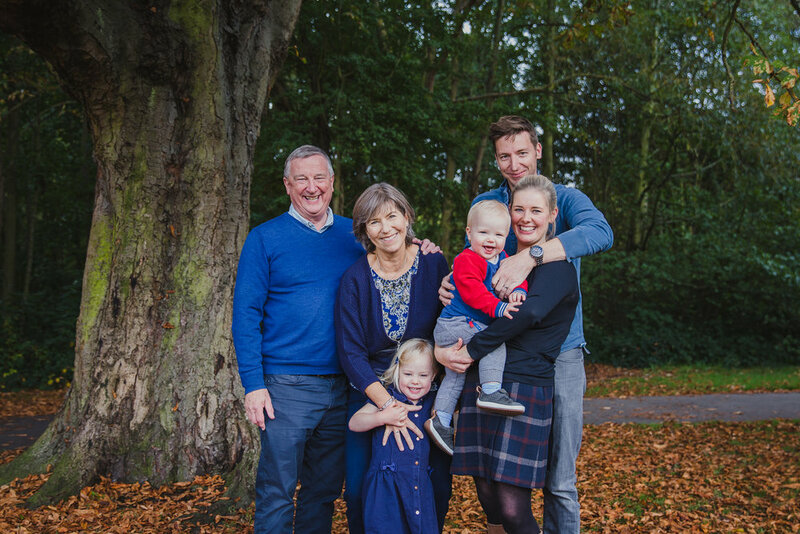 If you would like some natural fun-filled family photographs, please do get in contact by clicking here. More information on my Autumn sessions can be found here.